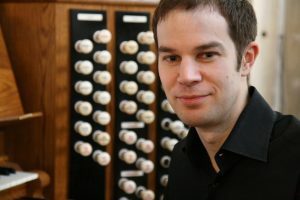 Simon Bell took up the appointment of Director of Choral Music and Organist at Dean Close School in Cheltenham in September 2012, in which capacity he directs the boys and men of Tewkesbury Abbey Schola Cantorum in the weekday services in Tewkesbury Abbey. His post at Dean Close also includes responsibility for all the choirs in the senior school. Prior to this Simon was Assistant Director of Music at Winchester Cathedral, and also held posts at Southwell Minster, Westminster Abbey and St Albans Cathedral. Simon is a graduate of Leeds University and the Royal College of Music where he studied for a post graduate degree in Organ Performance. He maintains a busy schedule of solo organ recitals and has made three solo recordings to date. Simon was also accompanist to the Waynflete Singers in Winchester and taught the organ for Southampton University and Winchester College.